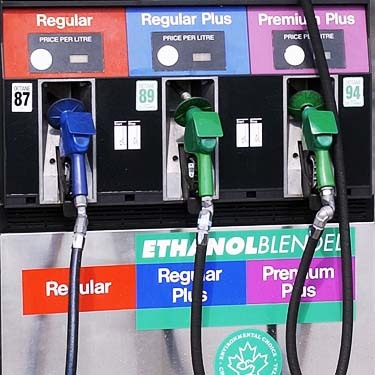 Does the Price of Gasoline Modify Travel Behavior? Studies show that American demand for high-priced gasoline is extremely inelastic (that is, Americans are willing [compelled?] to buy gasoline at their current promiscuous rate regardless of how high the price goes). For all these reasons, I recommend “planned congestion” as a very effective aversive technique for car travel. “Planned congestion” is a tool with which a community makes a conscious decision NOT to widen roads/intersections or synch traffic signals, or engage in other conventional methods to “reduce” congestion. Significant restrictions and higher prices for parking are also relatively effective ways to influence travel behavior. In Gainesville, Florida, very high parking costs and parking inconvenience on the University of Florida campus led to a nation-leading increase in bus ridership by UF students in the late 1990s. As Donald Shoup points out, higher priced parking overwhelms higher priced gas in terms of impact on your pocketbook. After all, even with a gas guzzler car and gas that costs, say, $4 per gallon, howmuch would it cost to drive across town? But look at how quickly the price of that trip goes through the roof if we jack up the price of parking from, say, $1 to $10 per time parked across town (which is quite fair, given the public and private costs to provide parking). This is not to mention the highly effective nature of “congestion fees,” in which you charge motorists fees based on when they are driving on major roads that tend to become congested, and even better, to charge fees that vary throughout the day (higher fees charged when the road is more congested). For the record, I am not recommending that Americans “give up their cars.” I just want the cars to behave themselves — by driving more slowly and attentively in towns, and by having their drivers pay their fair share. Fairly priced parking, parking scarcity, and congestion fees are very durable (in terms of modifying behavior), if designed correctly. They effectively send a very loud signal each day: If you choose the socially irresponsible, unsustainable travel behavior, you will pay through the nose. If not, you are free from such payments and can instead use your hard-earned money to spend a romantic weekend in Paris… The message is especially clear if you see your fellow citizens zipping along in the tolled or high-occupancy vehicle lane next to your bumper-to-bumper congested “free” lane, or if you see your co-worker chuckling over his/her higher paycheck because he is not needing to pay for his workplace parking space with his paycheck, since he/she gets to work by bus, and has “cashed out” their “free” job site parking space. There is a troubling, counterproductive “solution” that continues to be employed for addressing congested intersections – even in communities that are otherwise progressively promoting transportation choice. The “solution” is to add a second left turn lane to an existing left-turn lane when there is a perception that the number of motorists waiting in the single left-turn lane has grown too large. 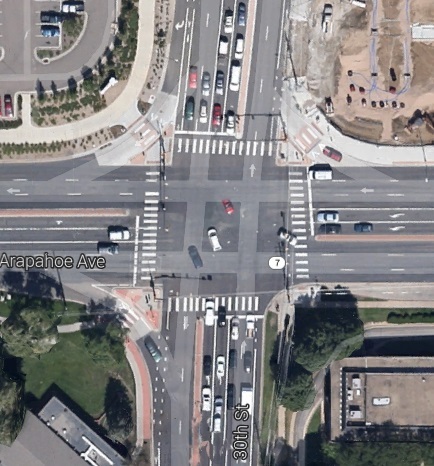 Conventional traffic engineering claims that creating a double-left turn lane at an intersection is an “improvement” that will reduce greenhouse gas emissions by reducing congestion. And that a double left turn does not conflict with the transportation plan objective of promoting pedestrian trips. On the contrary, I believe that double-left turn lanes will INCREASE emissions and will REDUCE pedestrian trips. Double left-turn lanes cause serious problems for scale and safety for bicyclists and pedestrians, but have been shown to be counterproductive even if we are just looking at car capacity at an intersection. Adding a second left turn lane suffers significantly from diminishing returns. That a double-left turn does NOT double the left turn capacity – largely because by significantly increasing the crosswalk distance, the walk cycle must be so long that intersection capacity/efficiency (for cars) is dramatically reduced. Cities across the nation are facing severe transportation funding shortfalls, yet at the same time, they are often building expensive and counterproductive double-left turn lanes. Why? Probably because of the absurdity that transportation capital improvement dollars are in a separate silo than maintenance dollars, and that the former dollars are mostly paid by federal and state grants. Of course, double-left turn lanes also destroy human scale and obliterates the ability to create a sense of place, but those are much more difficult arguments to make. Increase per capita car travel and reduce bike/pedestrian/transit trips. Increase GHG emissions and fuel consumption. Induce new car trips that were formerly discouraged (via the “triple convergence”). Cities need to draw a line in the sand: Place a moratorium on intersection double-left turn lanes and eventually removal of such configurations. Double-lefts are too big for the human habitat. They create a car-only atmosphere.